If you suffer from sewer backups or a flooded basement a Sewer Check Valve may be the answer. In certain areas of NYC a public sewer backup may cause a flooded basement. Sewer backups are typically due to heavy rains or over development in the area. This causes the sewer system to be over burdened. Without the protection of a sewer check valve, the over burdened city sewer system can backup (ingress) into your residence, thus causing damage and distress for a property owner. Such situations must be addressed properly, by a sewer expert to avoid spending money on unnecessary repairs and remediation. Balkan Plumbing is proud to provide one day installations, 5,000 PSI concrete, American made materials, and a written guarantee. Why a Sewer Check Valve? In most cases, a backed up drain does not mean that the house sewer line is defective or even needs to be cleaned. A cleaning should usually be the first step in diagnosing the issue. Often the solution to prevent a flooded basement and stop periodic backups is to install a sewer check valve. These are also known as backwater valves. A sewer back water valve is a one-way valve that permits waste water to flow out, yet automatically seals when sewer water attempts to enter the house system. A sewer check valve (backwater valve) is a very simple and dependable device. Although they greatly reduce the back-flow of water, sewer check valves may allow sewer backflow in some situations. The sewer check valve is primarily effective when a storm overwhealms the city sewer system. A defective public sewer which leaks for a long period of time can compromise a sewer check valve. More expensive and sophisticated devices are available for such situations. We have found that in most cases, more advanced devices are unnecessary. Work started and completed on the backwater valve in one day with no sub-contracting. Most sewer check valve installations include a slip resistant, water tight access pit, with a fitted cover. All disturbed cement is professionally restored using 5,000 PSI concrete that is also water proof. American made materials and fittings. A work site left broom clean. A completed installation performed at the quoted price. Bring an end to city sewer backups flooding your basement. Once installed, a sewer check valve will need maintenance once or twice a year to make sure it is clear of any debris or sediment that may block the flapper in the valve. This maintenance is done in minutes by removing four screws with any number of simple tools. No special skills or tools are needed, and this maintenance will ensure many years of dependable operation. Joseph L. Balkan Inc. has been specializing in all types of sub surface plumbing issues for over 60 years. This family owned business has been installing sewer check valves, backwater valves professionally and successfully for many years and has a long list of satisfied customers. Because we use composite access pits that are water tight with fitted and locking covers there is an added benefit to our installations. Coupled with using 5,000 PSI concrete that is essentially water-proof the finished installation itself is water-proof. That means that if you ever suffered from water seeping into your sewer pit from heavy rainfall, a groundwater condition, or other reason, that issue will be resolved. That will result in no more foul smelling and damp conditions that you may have been suffering with for years. In addition because our pits have fitted and locking covers you will not be left with a trip hazard or unsightly hole in your basement or garage floor. Because these pits and covers are made from composite materials they will never rust or rot away. Attention to detail is what makes our plumbing installations different form others. Balkan has a company-wide commitment to quality and service, and is backed by 60 years of experience. A prompt response over the phone or to any website inquiry by an experienced sewer and water main professional. A free on-site visit by an experienced field representative with no obligation whatsoever. A careful assessment of your situation. Balkan will never perform unnecessary work. You will receive a FREE written quote explaining the installation with no obligation. 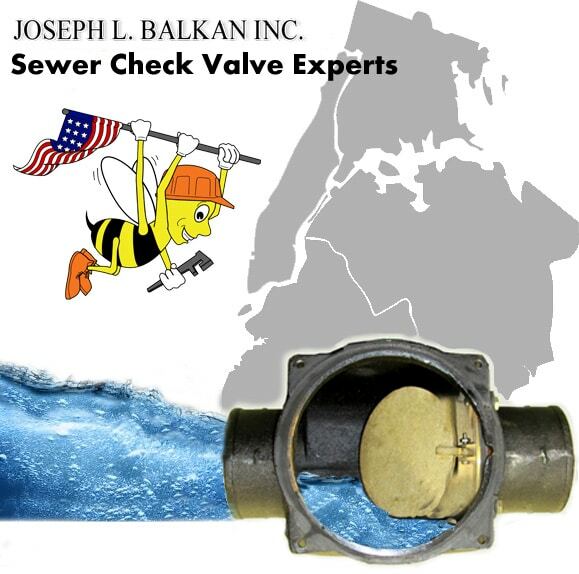 Contact a Sewer Check Valve & Backwater Valve expert via our 24/7 online form or call (718) 849-0900.